Sunward Steel Buildings, Inc. was the fabricator and supplier of this pre-engineered metal building in Waipahu, Hawaii, in May of 2004. Durable, sustainable and inherently adaptable by design, the steel building currently serves as a bakery and cookie shop for The Cookie Lady of Hawaii, who leases the property from a private owner. Offering a broad range of cookie varieties ranging from the classic chocolate chip to shortbread macadamia nut and the bakery’s signature lemon, The Cookie Lady became a fast favorite among residents of Waipahu and surrounding Oahu, with many fans traveling substantial distances just to get their fix. Designed and erected with Oahu’s typical climate and weather patterns in mind, the prefabricated metal industrial building is comprised of premium-quality steel components and features an unobstructed, clear-span design. Once fully erect, the steel bakery stands 54.33’x104’x20-24.58” in size, and it features a hardwearing single-slope roof overhead that protects the interior of the bakery and storefront against Hawaii’s sometimes-heavy precipitation. Rugged and accommodating, the metal bakery boasts a number of notable features, among them a 600-square-foot mezzanine and (9) 8’6.5” wall lights that offer plenty of illumination for workers. The steel building also features (3) 3070 walk door openings, each of which encloses one of (3) 3070 walk doors, and a 125-mph wind speed rating, an inclusion made in consideration of building code requirements currently in place across the region. 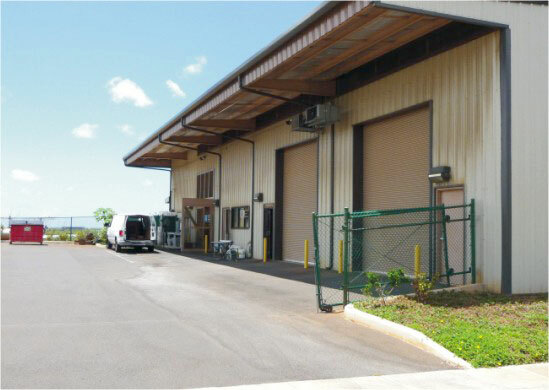 Premanufactured metal buildings are a particularly popular construction choice for business owners across Hawaii, many of whom run industrial or food-service operations similar to this one. Before becoming the home base for The Cookie Lady, this particular building functioned as a gourmet muffin shop, highlighting the easy adaptability of steel buildings and their ability to accommodate a range of purposes and business types. In addition to selling her soft, chewy cookies out of this Waipahu location, The Cookie Lady also bakes products in this building which she then transports to other retailers to stock on their shelves. A former sugarcane plantation town, Waipahu is a census-designated area located within the city and county of Honolulu, Hawaii, on the island of Oahu. Situated along the shore of Pearl Harbor, Waipahu neighbors a number of other small communities, among them Waipio, Waikele and Village Park. Considering purchasing a prefabricated steel building for industrial, commercial, retail or other use in Hawaii or another part of the country? Click here for a price quote.